O.V. Brantley and Mayor Chuck Shaheen with "Martin's Dream"
Yesterday, I presented Would You Act Like That in Front of Your Grandmother? at the Warner Robins City Council retreat. 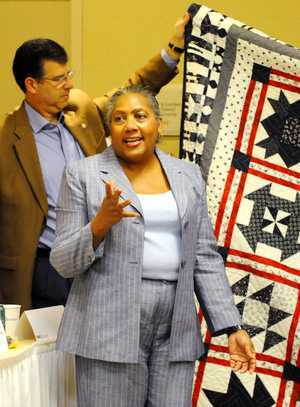 My presentation focuses on the importance of Council/Staff relations and illustrates my points through quilts. I am a huge proponent of civility and professionalism in the work place. Often in political environments people forget the basics of good manners, or they decide that good manners are not necessary in the rough and tumble world of politics. While I was Fulton County Attorney, one of my quilts hung in each conference room. I observed that quilts seemed to have a calming effect on people as they reminisced about their grandmother’s quilts. That is how I came up with the title of the presentation. Whether my audience agrees with me or not, they always love the quilts. « Do Judges Make Great Mediators?